As Campbell told Dennis Hunt of the Los Angeles Times, “[My mother] pushed me and made me see trying to be a big solo singer was something I should do. Without her pushing, I’d still be in the background. To some extent, that’s what happened to her. She has a good singing voice that she never fully developed. I guess nobody pushed her to get ahead. She didn’t want to see me waste my talent too. When I was younger I wasn’t sure what I wanted, but she knew what was best for me, and I went along with it.” Rhonda went on to become Tevin’s co-manager. In 1988, a friend of Campbell’s mother arranged for the budding young singer to audition for jazz flutist Bobbie Humphrey by singing over the phone to her in New York. Humphrey took an immediate interest in Campbell and submitted an audio and videotape to Warner Bros., which led to a meeting with Benny Medina, the label’s senior vice president and general sales manager of black music. Campbell was introduced to the R&B world by Quincy Jones in August 1989. Campbell’s debut single was “Tomorrow (A Better You Better Me)” which reached number 1 on the Billboard Hot R&B/Hip hop Singles chart in June 1990. This was a vocal version of a 1976 instrumental by The Brothers Johnson. It was the lead single from Jones’ critically acclaimed ensemble LP Back on the Block which won the Grammy Award for Album of the Year in 1991. After working with Jones and writers and producers including Siedah Garrett, Campbell worked with producers Narada Michael Walden, Al B. Sure, Babyface, and others to record additional music. Campbell’s first solo hit was “Round and Round”, which charted at #3 on R&B charts in November 1990 and #13 on the Billboard Hot 100 in April 1991 was produced by Prince and was featured in Prince’s film Graffiti Bridge. Campbell followed the success of his first two singles by releasing his debut album, T.E.V.I.N., in November 1991 which featured the R&B hit singles and Campbell’s #1 Adult Contemporary hit: “Tell Me What You Want Me To Do” followed by:, “Alone With You”, and “Goodbye”. I’m Ready released October 1993, yielded the #1 R&B hit and #9 pop single “Can We Talk” in December 1993, “I’m Ready”, “Always in My Heart” which charted at #3 on the R&B chart. He also scored a Top 30 hit with “Don’t Say Goodbye Girl” on the R&B charts. In September 1994, Campbell also scored an R&B hit with the single “U Will Know” as part of the R&B supergroup Black Men United, a group that also included singer Usher.In 1995 he sang two songs featured in A Goofy Movie which was I2I and Stand Out. The year 1996 saw the release of his third album, Back to the World (#11 R&B). The title track was a success (hitting the R&B Top 20), but additional singles failed to make an impact on the chart. His early 1999 self-titled album found Campbell venturing into the neo-soul venue. The project was rushed, and as a result charted below the R&B Top 30, with only a single charting, a Top 30 song called “Another Way”. 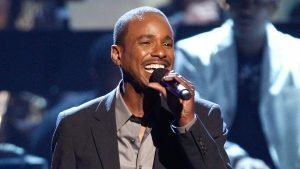 In 2009, Campbell made an appearance at the 2009 BET Awards as he paid tribute to The O’Jays with Trey Songz, Tyrese, and Johnny Gill. In May 2010, Campbell performed on The Mo’Nique Show. He said that many people wanted him to work again on music and is thinking about a comeback. In November 2010, he was featured on the remake of a song by Quincy Jones called “Secret Garden”. The remake features Usher, Robin Thicke, Tyrese Gibson, LL Cool J & Barry White. TVOne’s hit show Unsung will feature Campbell’s life and career, as well as updates on his comeback. Air dates are scheduled for early Summer 2011.